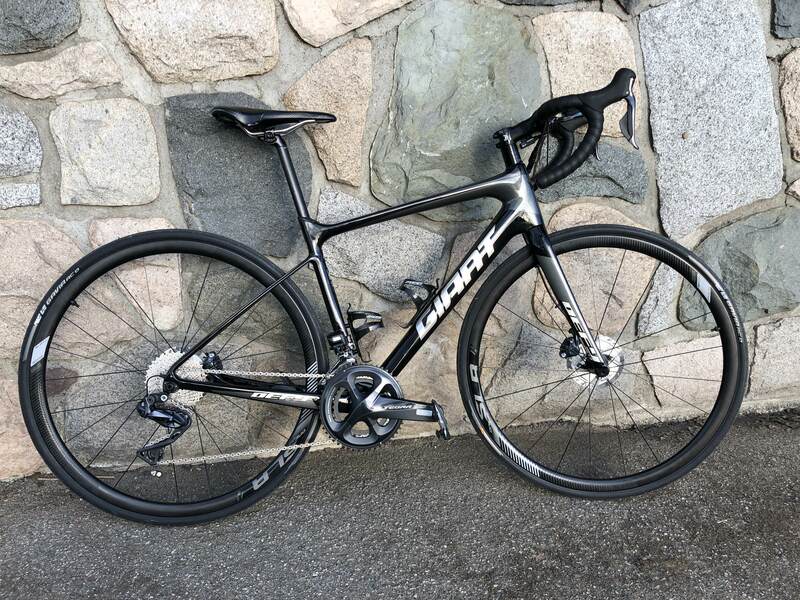 Got the call a little earlier, my new Giant Defy will be ready for pick up this evening. So now I'm thinking about cassettes, the Defy comes with an compact crank and a 11-34 (11-13-15-17-19-21-23-25-27-30-34) cassette. That's gonna be a little different than the standard crank and 12-25 that I'm used to. I don't see the 30 & 34 cogs getting much use. I switched from 11-28 to 12-25 because I didn't often use the 11 or 28 cogs, and I really liked the 16 cog. Though I occasionally miss the 11 cog on a steep decent, I prefer the 25 cog over the 28 when the road tips up. I'm not really asking a question, merely cogitating whether I'll stick with this cassette or pop on a 12-25, maybe even a set of mid-compact cranks. I guess I'll have to log a few hundred kms to see how I like the ratios. A 12-25t cassette,with a compact crankset, is a great setup for flat to rolling terrain. A strong rider can also enjoy the setup in the mountains if they have a good high cadence spin. I'd rather have 16T as well. I got a quick ride in this evening after picking up the bike, the 11-32 has got to go, it's useless. I went from 10/10 useful cogs on my SuperSix EVO to to 5/11 useful cogs on the Defy. And the worst thing was that there's no good transition point when switching from the big ring to the little ring. On the EVO I most often rode in the middle 4 cogs on the flats, engaging the outer cogs when the road tipped up or down. And the 15 & 16 cogs were great transition points between the chain rings. On the Defy I spent the ride on 5 cogs on the high end, never going lower than the 23 cog, on rolling terrain, one steep climb of > 10%, lots of 5-6%. Hmmm, do I want to go 12-25 or 11-28 with the compact. I'll have to check the ratios before making a decision. I'm have this dilemma as well. I have a compact crank but a 11-32 cassette (11-12-13-14-16-18-20-22-25-28-32). I never ever use the 32, and I really miss the 15 cog. But which should I go with? 11-25, 11-28, 12-25, or 11-30? I would get 11-28. Even if you don't need a 34-28 low gear the 28 will reduce the number of shifts you need to make to the small chainring. Get 11-25 or 12-25 if you really think you will miss the gears in the middle. I have an 11-34T and an 11-36T cassette. Soften TFU. I’ve got a Jake The Snake that I use a couple times a year for rides when I need to carry saddle bags. It’s got a compact crank and an 11-28, and the ratios on that bike don’t inspire grief. I’ll have to pull it out of storage this weekend and refresh my memory. Hmmm. It is a heavier bike that’s usually only ridden while laden with panniers. I ride a 12-27 10 speed. If/when I go to 11-speed I would add, in order, a 30, 18. And, ummm, that's it. Maybe a 32 as a real bailout gear. I have no interest in an 11. If you miss the 11t on your 12-25 then get a 11-25, unless you will then miss the 18t. To the OP, I'm surprised you didn't opt for the mid compact if coming from a standard crank? If you're like me in the flat lands, the (11,12) cogs and (27+)cogs are completely uneeded. I spend 80% of my time in the middle of the cassette. Shoot, my Jake has a cyclocross compact crank, not a fair comparison. Mid-compact and a 12-25 is looking pretty good. I made a 12-28 that fits my needs. I took my original 11-28 and bought a 12-25. Then I combined the two finishing with a 12,13,14,15,16,17,19,21,23,25,28. For me, the gaps work fine and I really like having the 16. I use this on a 50-34. I'd miss the 18t cog. I also use a 50-34 crankset, but there's nothing I can't climb with 34x25(at least in my area). does it come with a mid-cage derailure though? it looks like it has the GS version. I have bought about 30 cassettes in the last 5 years for immediate family and more for others. I cogitate too. Brand and models shift differently even if the same ratios. And I *think* certain materials are better. My fav cassettes for weight are alloy (several brands). They do not shift the best. I ordered a carbon fibre cassette and never got it but so far alloy, alloy different plating, Ti, Steel in many platting and coating. They are different. I prefer a big big vs a small small. So for anything a 53X14 is preferred over a 45X12 ~ same gear. The smaller mean more chain tension = more frame compression = more flex. Modern frames are real stiff and this is likely a left over tandem flex phobia. My stoker and I turned up about 3,000W in a sprint and in the 90s the 57TX11T would break. WE used a 12T. My kid races, I buy 12 and 13T as the low. Nothing he needs an 11 for with a 52T front. Enter MTB and cx and there are other clearance reasons for smaller front. He has 11T. This is a road sub-forum. If you have a 52T, you don't need an 11T. If you are cross chaining onto that, never-mind. For rec riding, and some non-road racing I think the 1X is a good option. I can see an 11T there, maybe. I'd build from a 12T or 13T min. I use a 14T but that is because I have a pile of left over junior stuff, I use now. On the big cog, and ratios that is tough. If you live in alpine regions there are some ratios that focus on big and small and have very little mid. Recon has a 11-29 and a 12-28 with few in the middle. the intent is small ring up, big ring down. Or 1X up and down. I have a 11X36 (or is it 40) on the cx bike on a 1X. For road - I like a "normal" 12-28. Maybe a 32. I'm riding this old junior 14-17 now. Last edited by Doge; 03-29-18 at 12:00 PM. Will I need to also change the cage? ish, that don't blong on a rode bike. Looks like long cage. Just curious how you ended up with pretty much all different drive components than what your used to? I am worried that it won't fit your riding style as it is not one but two steps away from standard gearing with that massive rear cassette. Sounds like you might want to swap the whole lineup unless you end up liking it.